yeah, i know. for someone who despises walmart, this is huge. and dare i say it - kmart is even worse. ugh. and why, pray tell did i brave the grossness of the home of the blue light special? 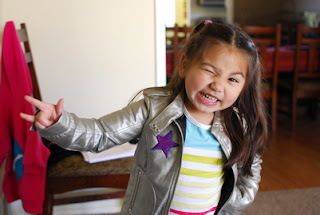 well, i'd learned via facebook that kmart was the only store that carried a silver girls' jacket perfect for transforming into a replica of the FBB's "rock star jacket." and we all know the lengths i'm willing to go for my kids. 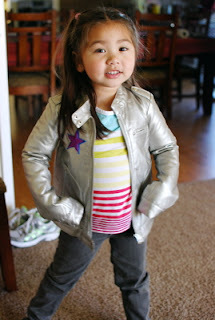 so yes, i located the silver jacket - on clearance, even - and scooped it up. now, since tons of other parents of FBB fans discovered this thing at the very same time as i had, it was super duper hard to find and sold out completely online. so i was stoked to get my hands on one of the golden (silver?) tickets. the only problem? 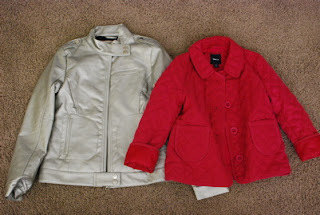 well, that's it on the left, and one of the bean's jackets (which is actually a little big on her still) on the right. gah! the silver one's a size 12, and the pink...a 5. yeah. for some reason, i was feeling super confident in my skillz and decided that i could totally just cut into the damn thing, resize it and sew it back together again. easy peasy. um, NO. i spent the next several weeks inspecting it, turning it inside-out, looking up tips on resizing existing clothing (specifically, a lined jacket with a zipper), and generally fighting off the urge to pick up the scissors and snip, snip, snip the thing into oblivion. 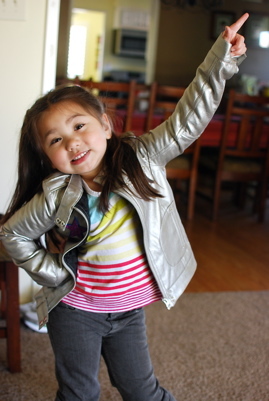 finally i realized that it was just too big of a task for this still-novice seamstress to tackle, and decided to pick up some silver pleather at joann's to make a simple unlined jacket for the bean to wear. one time. to one concert. so not a big deal. but then when i headed out to a different kmart to return that size 12, something told me to take the few extra steps to the girls' department and take a looksie. and wouldn't you know it - right there on the rack was the very same jacket...in a size small - a 4/5. i snatched it up as if it were a winning lottery ticket, squealed, and did a little dance in the aisle. 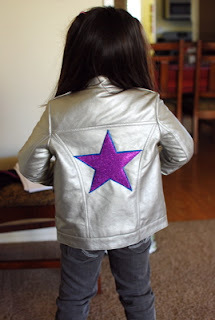 i spent just a little bit of time cutting out stars from glittery foam material, sewed them together, and then attached them to the jacket. and someone was SUPER excited when she saw what i'd done. she even struck a couple of silly poses, with or without some possible coaching from her mother. i will neither confirm nor deny. the jacket is absolutely perfect. well, it's not one she's going to fit into for too long, so we've already offered it to another huge FBB fan we know - our friend nanette's em. as for that silver pleather - well, when i tweeted about it, another buddy who's taking her little girl to see the show (albeit on a different day) dropped the hint that she'd love a rock star jacket too. and so i'm attempting to sew together a simple one that'll hopefully work just fine. 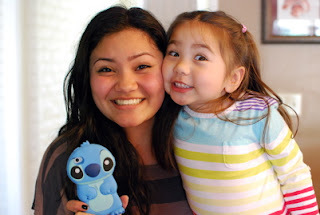 oh, and because she deserves a little blog time too, here's my gorgeous teen. she'd just come home and opened a package containing that phone case she's holding up there, and of course the bean busted out her photobombing skillz when she saw the camera pointed at her sister. like mother, like daughter(s). yup. Love all the pics. ADORABLE apos! SUCH a great job, Jenny! UGH. SHE IS THE BEST. Where did your daughter find that case? I luv it!! cute!! I just made my daughter one and I used Tulip brands glitter iron on packet- it comes with 4 sheets, 2 sheets are blue and purple!! I just ironed it on!